Have you ever wished you could fit several handpans into one case? I must start by saying that the players and makers that make up our handpan community will never cease to amaze me. 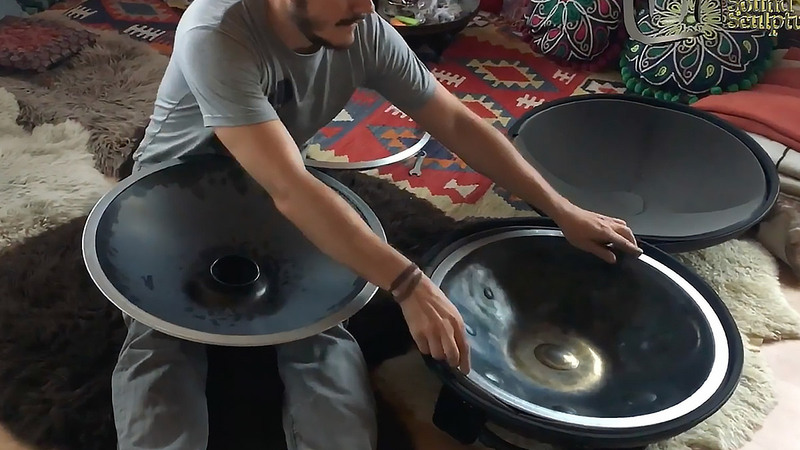 Daniel Bernasconi, creator of Soma Sound Sculpture handpans, has been developing a way to do just that. No magic involved, just pure genius! The “Shellock” is a solution that shows a lot of promise. ‍The design is a ‘clamp’ system that allows a top and bottom shell to be fixed together to form a complete instrument, without the need for glue. This means that two separate shells can be assembled as and when required. What an innovation! According to Daniel, up to 6 top shells could fit into one Evatek case. Being able to travel by plane without having to register 4 or 5 handpans as baggage to go in the hold would be an unbelievable luxury. Also, this could also be of great benefit to the event organiser. For example, if this project were to be launched commercially, the musician would only have to transport their top shells, stacked into one case. The organiser, for their part, would hire (theoretically! ), or buy, bottom shells (the Gu side), to which the musician could then attach any top shell to make a complete instrument. As bottom shells are less labour-intensive to produce, they would be much more economical to stock, in comparison to paying for extra baggage to go in the hold for each performer. As well as the super-practical side for travelling to concerts, this concept could go a step further. Shells could be ‘mixed & matched’; for example, keeping the top scale but changing the bottom shell and allowing for different ‘bottom notes’ to be added. It would allow the freedom to experiment with different tones, colours, playing styles, etc. You could even create your own combinations by attaching two top shells to produce ‘double-sided pans’, the possibilities are endless! Although, like me, you might be really excited by the prospect of this idea, the inventor of the Shellock is keen to remind us that it is currently still in its prototype stage. I really believe this has great potential. Take a look at this video illustrating the concept, and watch this space! Leave us a comment! What do you think of that idea?